When you look into yourself to see if you have these qualities and predict to an extent and if you may be like them or to look to your friends to see if they might be successful. All of these are going to be in your control at least to some form which you can also take these traits and grow them, constantly work on them to increase your comparative advantage to be more successful. 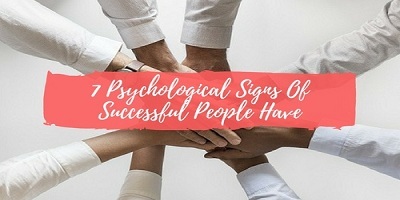 So, here 7 best psychological signs that successful people have and learning this tips will help you to become successful and achieve your goal in your life. Successful people are usually highly competitive and in many ways, they are competitive when selling a product, when advertising, when offering the cheapest price, when reaching goals. But it all comes down to competitively offering the most value. Take a look at some of the largest brands out there, they all have competition and without their CEOs being super competitive they would not have succeeded. With other brands businesses and people in your market that are trying to steal your customers. This happens all the time but what distinguishes massively successful people from the rest. It is a fact that they are competing against previous versions of themselves and they are always bettering themselves in many ways. So, having a competitive nature is a great trait of someone successful. So, when most people think of obsessive behavior a negative connotation is correlated with it. But think more like much focused, driven, and dedicated. You can't have a multi-million dollar business without being obsessed with the product, your employees, your customers and most importantly your vision. This trait ties in with the first one to be competitive always tracking your competition being obsessively tracking your own growth and always knowing where you are. Psychologically being obsessive means that you are always thinking about it, adapting it, and changing it to be better. There are many ways to learn but, most successful people never stop learning, when they stop learning they stop being successful. You just have to stay ahead of the curb reading new books, going to seminars and conferences about your thing. Talking to the most successful people in your industry, testing, learning, experimenting or Buffett whose net worth is over sixty billion dollars reads at least five hours a day every day. Most people don't even pick up a book after graduating and getting a nine-to-five job. Remember the more you learn the more you will earn. Just like obsessive behavior is tied in with competitiveness, thinking ties in with learning. Successful people especially entrepreneurs are always thinking. Thinking how I can do this better, how can I reduce the cost of this, have something like this ever been done before. The cool thing about it is the more you learn the more you can think about, the more you can experiment, and the more you can increase your chances. Now combined with hard work to become even more successful. Napoleon Hill stated this and is thinking Grow Rich book, having more ideas and learning more will, in fact, produce more and more ideas, like imagine ideas in your head as people. If you have two people in a community you don't necessarily want their children having children with each other. Introduce them to more ideas so that they can have healthier and even more children. Now that was a weird analogy but if you're in a rut start doing something to learn more so that you can think more so that your brain will grow new ideas and start solving problems all by itself. A psychological sign of highly successful people is that they end things or in other words, they are persistent. I know a lot of people struggle with this one but ending things is a great predictor of who is going to be successful later in life. If you've ever started a puzzle but never finished it it's like starting a business and not continuing to grow it. There are many people who like this and actually, we need people like this but there will always be someone more successful than them. We need starters, people who have ideas, people who invent, people who create things and fail. But those who stick with it and continue to grind when things get hard, those are the ones who are going to make it big, remembered and stay in history forever. Markets are you selling clothes, are you selling electronics, are you starting a retail business. Someone is going to stick with it longer, learn more, think more, be more competitive and squish their competition. Who didn't do all those things? So, this tip could be summarized into staying persistent. I really like this tip, but I know a lot of people struggle with it specifically because it involves meeting new people and maintaining a relationship. It also involves cutting out toxic people in your life and most of the time the most toxic people in your life are the ones that you're closest to you. But if you're not spending at least a third of your time around people who are doing better than you, you are draining yourself and you're throwing a lot of growth and potential success away. A lot of motivation, inspiration and work ethic problems could really be solved, just by changing the people that you spend most of your time around. Think about that. Spending time with these people will also help you with learning more about thinking more and to increase the quality of the people in your circle to increase your chances for success. Most people like to surround themselves with people in a way that they will always feel most successful. But by surrounding yourself with unsuccessful people compared to yourself, you'll stand out and feel bigger but you will not continue to grow. So, getting rid of your ego and spending time around people who make you feel like you are less than them not in a negative way, but in a way that you could jump up to be with them will make you better if you implement it correctly. That's kind of like a tongue twister but this tip comes into play not only in business but in life in general. You will be happier, have more energy and even make better decisions. Everyone knows what optimism is, so let's discuss realistic optimism. You're not going to be happy or a millionaire if you're complaining about how the stocks are super low, how nobody will buy your product, how your competition will always be better than you. So, you have to have some form of optimism however, you can't go too far the other way either. Don't pay fifty thousand dollars for a product that you have not tested. You have to be realistic about it too, just because you have an awesome idea that came from your heart and your mom supports you 110%, doesn't mean that people are going to buy your solar-powered eco-friendly toothbrush. Optimism does great things for your mental health and actually for your physical health also. A study that I read and learned optimism written by Martin Seligman showed that optimism could actually reduce your chances of cancer. But the same book also said most optimistic people had a deluded perception of the world which is why you have to balance it out and be realistically optimistic. So, these are the 7 things be on the lookout for these qualities in yourself and your friends and work every day at developing these traits. Because I believe and psychology proves you can improve some of these. You can become more optimistic, you can spend more time with higher-quality friends, you can pick up a book for 30 minutes a day and learn something new. These traits are what will set you apart from the crowd and from those who will continually complain about how unsuccessful they are and those who will sit in a chair 70 years from now wishing they had another chance. I'm truly inlove with this blog. you've got a well detailed article here.